Start taking control of your online presence with this free resource co-developed by yours truly. Claim your major Local Search listings efficiently and effectively with Moz Local. Explore the Local Learning Center at your own pace & be empowered to make the right decisions in your online marketing—turning the web into an incredible customer acquisition tool for your business. Learn all (or at least most!) of the key jargon related to the field of search engine marketing. A great reference if you really want to start diving into this space for yourself. My annual survey of 30-40 of the top Local SEO practitioners in the world about what’s working in local search (and what’s not). My most popular infographics, illustrating how local data flows around the internet (and eventually gets ingested and displayed by Google). A terrific resource for ongoing answers about the topics that most interest you, staffed by the smartest minds in local search. The Beginner’s Guide to Search Engine Optimization (SEO) is an in depth tutorial on how search engines work, covering the fundamental strategies that make websites search engine friendly. For small businesses with brick-and-mortar locations, there are two main elements to Search Engine Optimization (SEO): organic and local. Search engine optimization involves a number of content management techniques that make your website as easy as possible for search engines to find and filter. These techniques include proper keyword targeting, title tag and meta description specificity, consistent site architecture, and a number of linking strategies both within your site and between your site and others like it. Google and a number of other search engines publish suggestions that will help give your site higher rankings, but typically it takes an experienced consultant to propel your site into the top five results, where approximately 80% of all clicks come from. Search Engine Optimization involves a relatively high initial investment but can reap an enormous number of “free” clicks if done well. If you’re considering a website redesign or restructuring your website in any way, it’s critical to bring in an SEO consultant like myself as part of your small business’ internet marketing strategy. These are the default #1 search results for businesses that depend on geo-targeted search traffic. 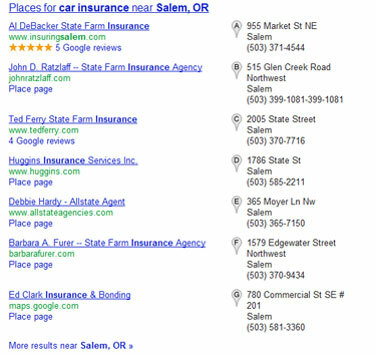 Since January 2008 all of the major search engines, including Google, have displayed a separate interface at the top of their search result pages for locally-targeted keywords and keyphrases (like “Pizza in Portland, OR”). This new interface typically features a map and a combination of either three or seven text listings (known colloquially in the search marketing industry as a “Local 3-pack” or “Local 7-pack”). They also show these listings for selected product & service-based searches without any geographic modifiers. In fact, approximately 30% of all searches are performed by people looking for a Local product, service, news item, or event. That is over 6 Billion searches every month in the United States alone. Simply put, Local is the hottest segment in an already very hot industry. What many businesses–and even some search engine optimization consultants–don’t realize is that Google ranks Local results like these by a completely different algorithm. The factors that matter for ranking in Local are, for the most part, quite different from those that matter for ranking organically. As the creator of the authoritative Local Search Ranking Factors document, I am one of literally a handful of consultants in the world with specialized expertise in Local SEO. If your business gets a significant amount of traffic from geo-targeted searches, even a brief strategy review or hourly consultation with me will bring you significant ROI.